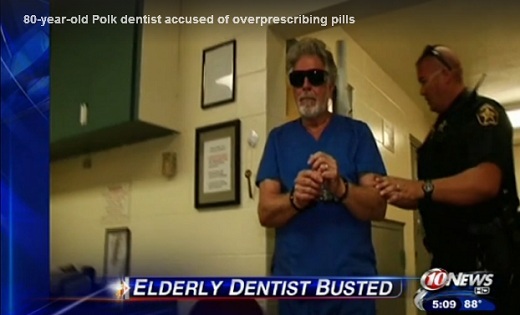 Does this older dentist really want to spend the rest of his life in lockup? That is where he is headed and the pharmacists too. Polk County Sheriff Grady Judd calls them "greedy" and "dope peddlers," when talking about an elderly dentist and two pharmacists arrested. Sheriff Judd has long since gone after pain pill pushers in his county, and these men he says are "misfits operating outside of the law." On Wednesday, Polk detectives, along with Department of Health inspectors and the Office of State Attorney, arrested 80-year-old William Johnson. Dr. Johnson is the owner of the Sonrise Dental Clinic in Lakeland. He's charged him with a third degree felony -- Knowingly Overprescribing Controlled Narcotics. The investigation began back in May, when detectives arrested Dr. Johnson's stepdaughter, 46-year-old Stacey Sumner. Sumner was accused of forging her stepfather's name on prescriptions for Hydrocodone pills and getting them filled to support her own addiction to the pills. Stacey worked as a receptionist in her father's dental clinic. Deputies say over a 15-month period, Sumner forged 519 prescriptions for her own personal use. That brought suspicion upon the clinic, and Polk detectives obtained search warrants for Dr. Johnson's office. Department of Health inspectors say that Dr. Johnson was prescribing controlled narcotics to 72 percent of his patients. Based on this information and the fact deputies say that Dr. Johnson also facilitated his daughter's addiction to controlled narcotics, detectives began an investigation into Dr. Johnson knowingly overprescribing controlled narcotics. Come on now...Dr. Johnson knows better and facilitating opiate addiction. Well, he is entitled to a trial, but if found guilty, deserves the strictest of penalties. Also, bye bye dental license.